Today we brought Mr Burns home from Berkeley Animal Care Services. We are delighted to have him here with us and are looking forward to many adventures with him in the years to come. Mr Burns is indeed named after The Simpsons' Mr Burns. The shelter staff have a lot of rescued animals to name and sometimes run dry on inspiration. So when our new boy's litter came in, they just started naming after Simpsons characters. Mr Burns' sisters include Marge, Selma and Patty. Nice. 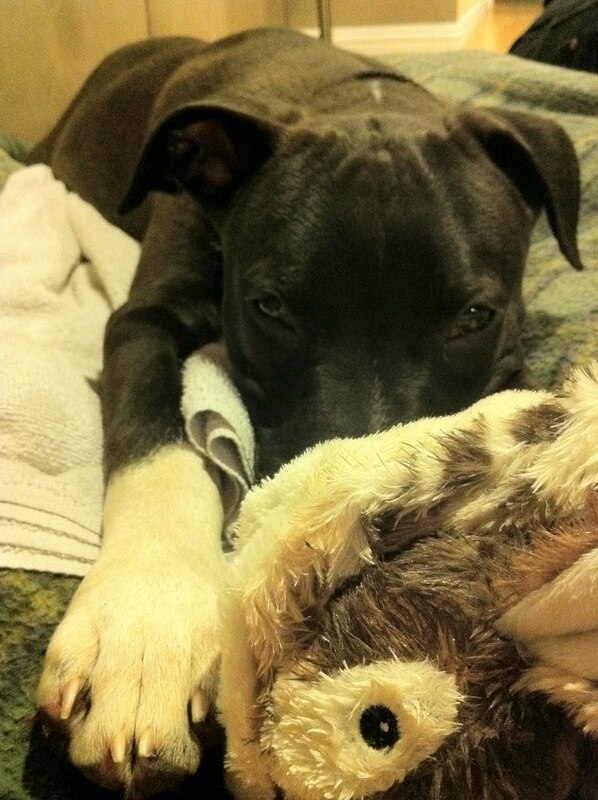 Mr Burns, the character, is nowhere near as cute as Mr Burns, the 17-week-old black & white pit bull puppy. But we do like the character's full name -- Charles Montgomery "Monty" Burns. "Monty" is growing on us, though Mr Burns is a great name. Already tonight, walking him through the neighborhood, people chuckled at his name -- exactly what we're looking for. 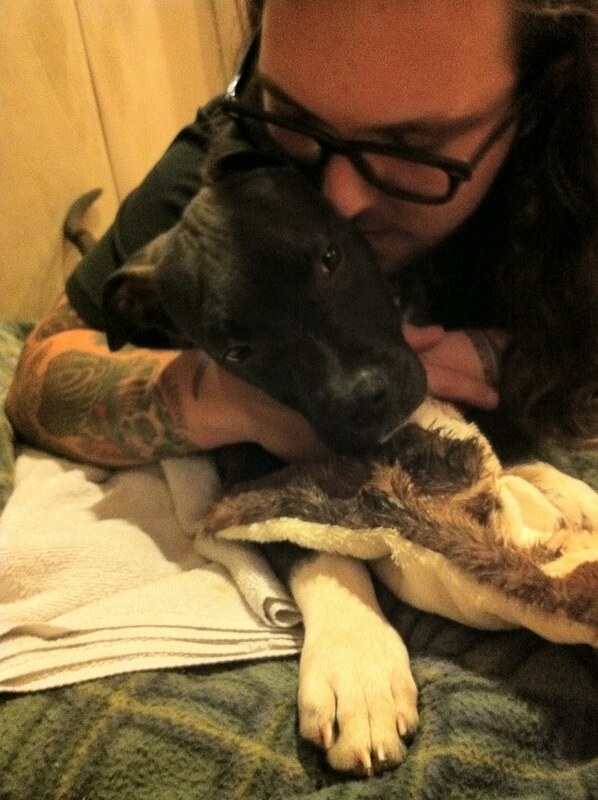 The world doesn't need another pit bull named Brutus or Killer. Make 'em laugh, make 'em laugh, make 'em laugh. And so far he's making us laugh. A lot. So, so cute. As we were driving home from Berkeley with him, I noted the time -- 6 months ago on this day we were in Davis saying our heartbroken, tearful farewells to our sweet boy Jasper. Funny how this worked out, that we brought home our new sweetheart on the half-year anniversary of that great sorrow in our lives. We all miss Jasper so much, and are so delighted by how love is not an either/or, but an and/both. We cherish our Jasper in our hearts and memories, love him every moment of every day, AND we love this stinky crazy new puppy currently sacked out on the couch in Joe's lap. Very sweet. Love and Sorrow can both be Forces Expansive. Thank you for sharing. 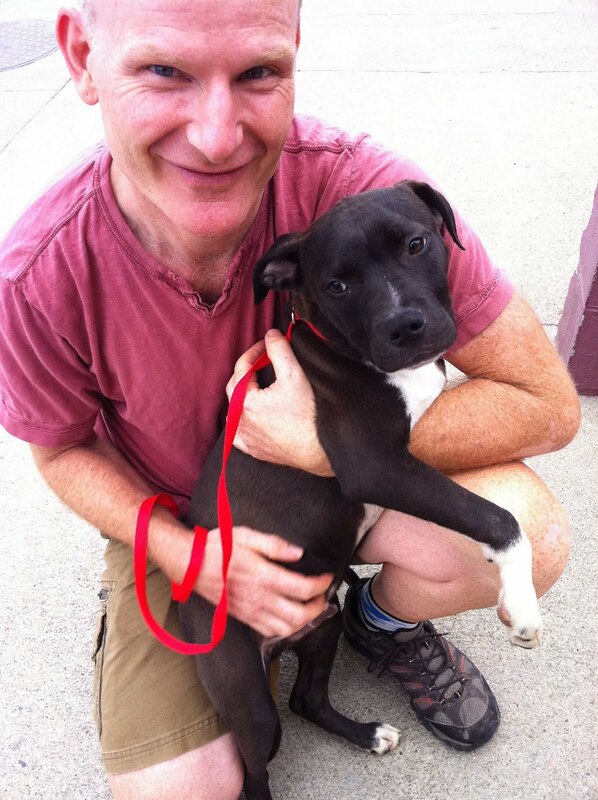 Big LOVE on Bad Rap and Berkeley Animal Care Services. We are forever in your debt. I DEMAND that his name stay Mr. Burns. Don't make me start a Facebook page about it!